Beautiful End Unit Townhouse In Cortina of Torrey Highlands. New Carpet Installed.Laminated Wood in Living Area. Large Master Bedroom Plus 1 Multifunction Room/Loft,Could Use As 2nd Br/ Office, Guest Suite. It Can Easily Expand To Have A Full Bath. High Ceiling With Lot of Windows, Covered With Cordless Wood Blinds. Open Kitchen With All Stainless Steel Appliances. Best & Convenient Location in Complex, 1 Car Garage Plus Assigned Parking Right In Front of Unit. 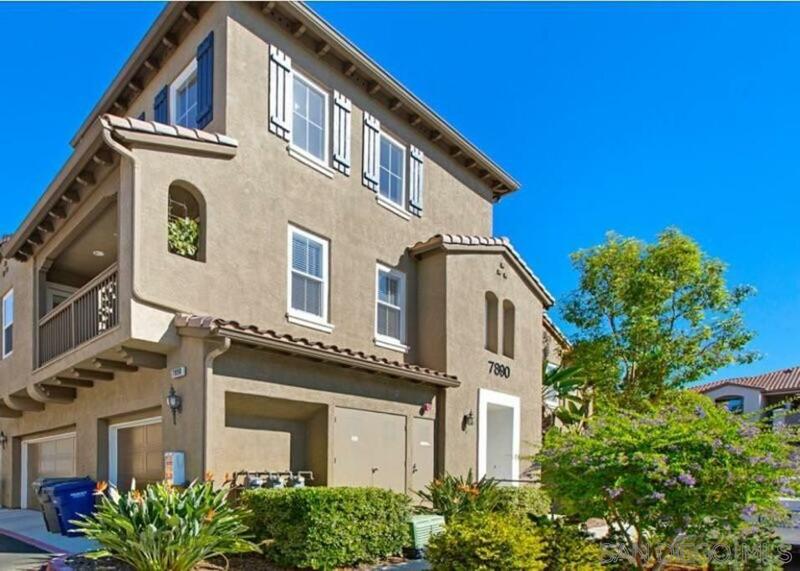 Walking Distance To Schools & Shopping Plaza, Beautiful End Unit Townhouse In Cortina Of Torrey Highlands. New Carpet Throughout Stairs And Bedrooms. Laminated Wood Floor in Living Area. Tiles In All Baths and Kitchen. Large Master Bedroom Plus 1 Multifunction Room/Loft Upstairs Which Could Be Used as 2nd Bedroom or Office, Guest Suite. It Can Easily Expand To Have A Full Bathroom And Increase Sqft and Value. High Ceiling With Lot of Windows, Covered With Cordless Wood Blinds. Fireplace In Living Room, Separate Dining Area. Balcony access from Dining area. Open Kitchen With All Stainless Steel Appliances. Best & Convenient Location in Complex. 1 Car Attached Garage Plus Assigned Parking Space Right In Front of The Unit. Visitors Parking Across The Street. Spacious Floor Plan. Well Kept & Quiet Community. Highly Searched and Affordable Model. Entertained With Community Pool/Spa. Walking Distance to Schools & Shopping Plaza. Award Winning Poway Schools. Highly Searched and Affordable Model in The Area. Furnitures are Negotiable. Seller Selects Services.